European garden spider Araneus diadematus, copyright Böhringer Friedrich. 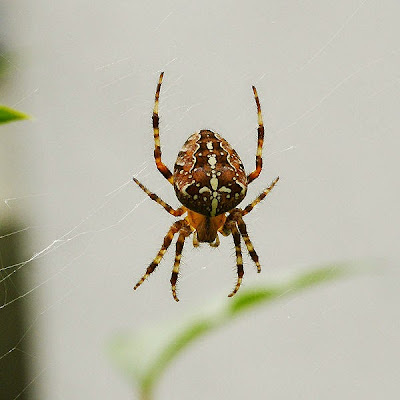 Araneus is a genus of orb-weaving spiders including the European garden spider Araneus diadematus and related species. The name has been used in a much broader sense in the past (at its broadest, as a generic name for all spiders); many of the species listed below would now be placed in segregate genera. The type species, A. angulatus, is a widespread species in the Palaearctic region characterised by angular lateral humps on the opisthosoma, which is mostly dark with a light cross-shaped marking between the humps. [DC01] Davis, M. J., & F. A. Coyle. 2001. Habitat distribution and life history of Araneus spider species in the Great Smoky Mountains National Park. Bulletin of the British Arachnological Society 12 (2): 49–57. [F11] Framenau, V. W. 2011. Lariniophora, a new monotypic orb-weaving spider genus from Australia (Araneae: Araneidae: Araneinae). Records of the Western Australian Museum 26 (2): 191–201. [L02a] Latreille, P. A. 1802a. Histoire Naturelle des Fourmis, et recueil de mémoires et d'observations sur les abeilles, les araignées, les faucheurs, et autres insectes. Théophile Barrois père: Paris. [L02b] Latreille, P. A. 1802b. Histoire Naturelle, générale et particulière des crustacés et des insectes vol. 3. Familles naturelles des genres. F. Dufart: Paris. [TB81] Tikader, B. K., & A. Bal. 1981. Studies on some orb-weaving spiders of the genera Neoscona Simon and Araneus Clerck of the family Araneidae (=Argiopidae) from India. Records of the Zoological Survey of India, Miscellaneous Publication, Occasional Paper 24: 1–60.